Red Neoprene Double Edge Steel Frame Squeegee 30" with 60" Handle BOWES SS 37515. 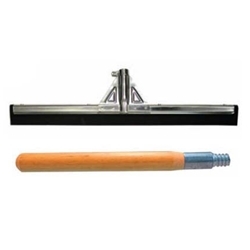 Squeegee for tough work. Ideal for workshops and large areas. Galvanized steel frame with a splash guard and reinforced handle socket. Available in black natural rubber and in oil resistant neoprene. Will accept standard ,15/16 diameter handle, tapered or square cut.